Home / Movie Database / Hail, Caesar! 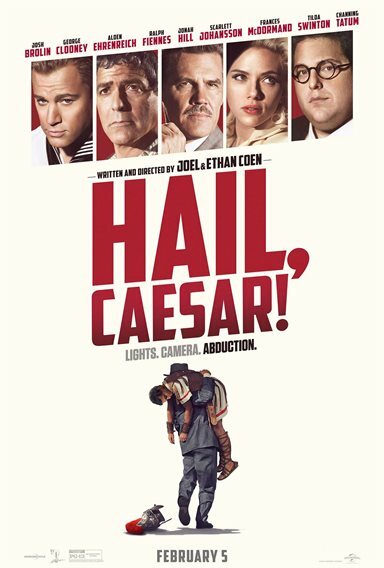 Four-time Oscar®-winning filmmakers Joel and Ethan Coen (No Country for Old Men, True Grit, Fargo) write and direct Hail, Caesar!, an all-star comedy set during the latter years of Hollywood's Golden Age. Starring Josh Brolin, George Clooney, Alden Ehrenreich, Ralph Fiennes, Jonah Hill, Scarlett Johansson, Frances McDormand, Tilda Swinton and Channing Tatum, Hail, Caesar! follows a single day in the life of a studio fixer who is presented with plenty of problems to fix. Download Hail, Caesar! in Digital HD from the iTunes store. Hail, Caesar! images are © Universal Pictures. All Rights Reserved. Hail, Caesar! is a movie with a laundry list of greats and one glaring not so great. Great Writers/Directors Joel and Ethan Coen (No Country for Old Men), great actors from George Clooney (Up In the Air) and Josh Brolin (Men In Black 3) to Scarlett Johansson (Avengers) and Channing Tatum (Magic Mike XXL), and great set and costume design. Unfortunately, all those greats can't make up for the not so great script. This may have lead up to the ultimate great for me… the great disappointment I felt when the movie was over. Eddie Mannix (Brolin) runs Capitol Studios, one of the big Hollywood production studios of the 1950s. His job is overseeing every production and "fixing" whatever needs to be fixed, including an unwed Ingénue's unplanned pregnancy, a clash between famed Director Laurence Laurentz (Raplph Fiennes; Harry Potter and the Deathly Hallows: Part I) and the untalented movie star he was forced to hire, and coordinating the safe return of Matinee Idol Baird Whitlock (Clooney), who is being held for ransom by some communist sympathizers. While Hail, Caesar! had so much potential, it seemingly got lost in a muddle of varying plots and jokes that simply fell flat. There were a few laughs, but there were many more moments that were supposed to be funny, but weren't, and at no point did I laugh so hard I cried. I expected more from the Coen brothers, but, in this case, they just didn't deliver. I also spent almost two hours trying to figure out what this movie was about. Was it a farce? Was it wry look at the 1950s movie business and the studio system? Was it a commentary on Communism and McCarthyism? I'm still not sure, and walked away confused and befuddled. The cast was terrific, but, while it was a nice change, I wasn't that enthralled watching Clooney play the Buffoon. However, he is so talented that he managed to pull it off well. Fiennes, Johansson and Brolin were all very strong, and a cast of other well-known talents helped round out the film. Unfortunately, because there were so many stars in the movie and so much going on plot wise, nobody really got the chance to shine and stand out in any memorable way. When speaking with an older colleague, she enjoyed the film more than I did, and opened how she and her husband watched the film trying to guess what real life stars these characters were modeled after. She ultimately decided they were each a mixture of a few different people as opposed to just one individual. I must admit, after thinking about it in those terms, I found myself mildly more interested in the idea of the film than I had been earlier. I also was more intrigued when I learned the main character was based on the real life Eddie Mannix who ran the studio and, allegedly, had mob connections. However, I believe most younger audiences won't make these connections and simply find the film boring. With so much potential, the Coen brothers could have once again made a film that left its mark on the movie industry, but this one just doesn't make the grade. I'm hoping this one was off and they will come back stronger with their next project, but only time will tell. It's a shame Hail, Caesar! isn't going to be that film.